From surgical removal of the prostate to watchful waiting, there are a variety of options when it comes to prostate cancer treatments. These treatments cover a wide range of approaches and impact life expectancy differently. 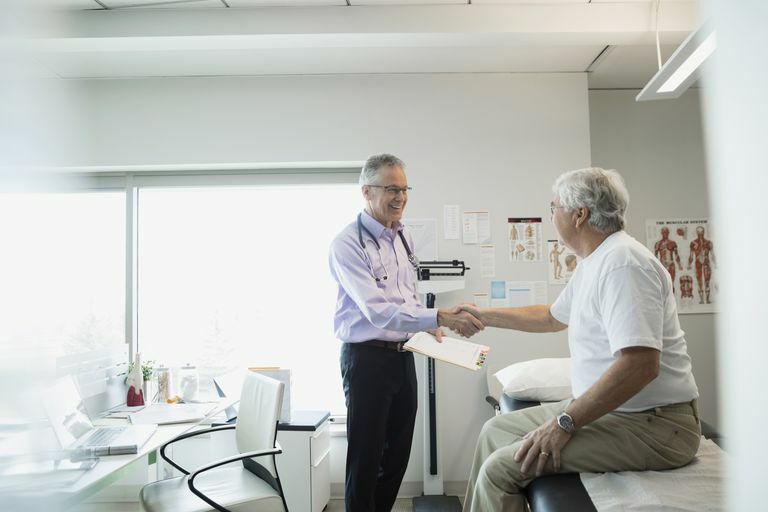 Here is what you should know about the available treatment options for clinically localized prostate cancer— and what research says about their ability to prolong life expectancy. What Is Clinically Localized Prostate Cancer? If you have been diagnosed with prostate cancer and your doctor has indicated that your cancer appears to not have spread beyond the prostate gland, you have what is known as clinically localized prostate cancer. Sometimes, doctors will also call cancer that has spread into the lining of the prostate gland clinically localized. According to the U.S Department of Health and Human Services, about 90 percent of men with prostate cancer have localized prostate cancer, and it is typically considered low-risk, meaning patients can expect to live long after their diagnosis, in many cases even without treatment. Active surveillance: Your doctor may want to monitor your disease to see if treatment is necessary. With active surveillance, you will have regular check-ups with your doctors, and he or she may perform biopsies regularly. If your test results change, your doctor will discuss your options for starting treatment. Watchful waiting: While some doctors use the terms active surveillance and watchful waiting interchangeably, watchful waiting usually means that fewer tests are done. You will still visit your doctor regularly, but your doctor will discuss changes in your health as they relate to managing your symptoms, not curing your disease. Prostatectomy: Removal of the prostate, called prostatectomy, is an option that has a strong likelihood of removing your cancer since you are removing the gland where it is located. However, this is an invasive procedure that can lead to other issues, which will be covered later. Radiation: Your doctor may suggest radiation as a means of therapy that targets tumors with radiation, usually through daily treatments in a hospital or clinic over multiple weeks. So how do these treatments affect life expectancy? In one study, researchers in Switzerland examined the treatment and outcomes of 844 men diagnosed with localized prostate cancer. They compared men who had been treated with prostatectomy, radiotherapy and watchful waiting and found that at five years from diagnosis, the type of treatment made little difference to survival. When the researchers went to 10 years from diagnosis, they did find a difference in survival based on treatment, but it was fairly small. After 10 years, 83 percent of the men who had gotten a prostatectomy were still living, compared to 75 percent who had undergone radiotherapy and 72 percent who took a watchful waiting approach. With active surveillance, your cancer may grow and spread. Choosing not to treat your cancer right away could lead to anxiety. Men who undergo radiation are more likely to have bowel problems. There is a chance you may lose bladder control after surgery. You may lose your ability to have an erection after surgery. The decision about how you will treat your prostate cancer is not one to be taken likely. Discussing the risks and complications with your physician and your family, and thoroughly considering your priorities, can help you make a decision that feels right for you. Arnaud Merglen, MD; Franz Schmidlin, MD; Gerald Fioretta, BSc; Helena M. Verkooijen, MD, PhD; Elisabetta Rapiti, MD, MPH; Roberto Zanetti, MD; Raymond Miralbell, MD; Christine Bouchardy, MD, MPH . Short- and Long-term Mortality With Localized Prostate Cancer. Arch Intern Med. 2007;167:1944-1950. U.S. Department of Health & Human Services. (n.d.). Knowing your options: A decision aid for men with clinically localized prostate cancer.